The Brown University Library welcomes Emily Ferrier as the Social Sciences and Entrepreneurship Librarian. As the primary liaison to the Nelson Center for Entrepreneurship and the department of Economics, Emily will assist researchers, students, and other University stakeholders as they develop entrepreneurial projects, conduct market research, explore business models, and engage in community partnerships to strengthen the local, national, and international scholarly community. 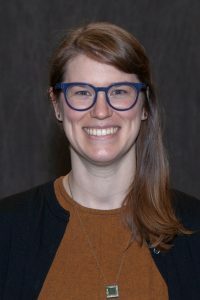 As a member of the Academic Engagement unit, Emily will work with other subject librarians, as well as the Center for Digital Scholarship, the digital repository team, and others in the Library and across campus to provide the resources and services to support this work. Emily will provide synchronous and asynchronous instruction on topics related to business and entrepreneurship, such as market research, business analysis, intellectual property, patents, and finance, and scholarly resources to support research and teaching in entrepreneurship and economics. Emily joins Brown from Olin College of Engineering where she has has served as the Senior Librarian since 2016. Most recently she has also served as the Acting Library Director. At Olin, Emily has supported open scholarship and Olin’s open access policy to provide preservation and access to scholarship including student and faculty research, data, and software. Emily has demonstrated commitment to diversity and inclusion through cross-institutional activities focused on ways to design support systems to address systemic issues that result in first year students, students with disabilities, and marginalized community members feeling excluded from campus and classrooms. Along with a cross-disciplinary team consisting of faculty, student affairs and the library, Emily and her co-authors’ related peer-reviewed paper, “Proactive Inclusion of Neurodiverse Learning Styles in Project-Based Learning: A Call for Action,” was presented at the American Society for Engineering Education conference in June 2018. Prior to joining Olin College of Engineering in 2016, Emily worked in the libraries of intellectual property law firms where she specialized in IP research, with expertise in legal, intellectual property, and business intelligence research. Emily earned her MLIS from San Jose State and a BA in History from Northeastern University. In addition to her professional accomplishments, Emily is a media producer of titles such as COLD HUDSON: A Slow Film. Slowness is a theme that has worked its way into cooking, photography, and now to the old house she is renovating.